The results are in! 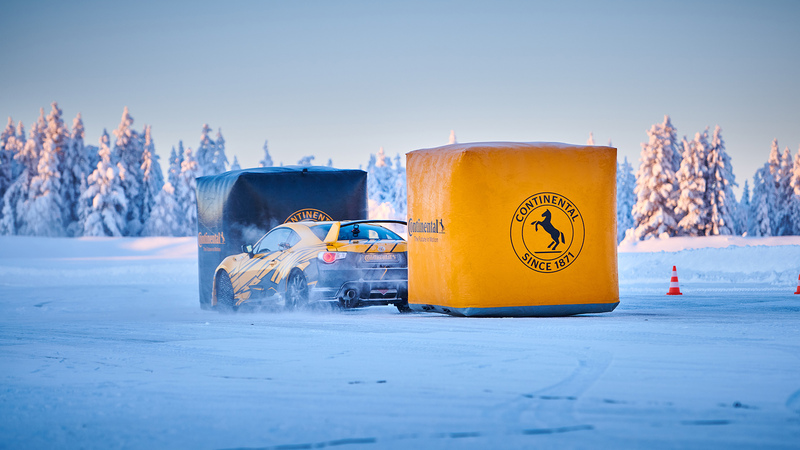 Who is the triumphant victor in our extreme winter driving challenge? When driving in freezing weather, a professional racing driver thinks about the same performance factors as the rest of us – precise control and safety. That’s why we’ve asked Mikaela Åhlin-Kottulinsky, a talented professional driver from Sweden, to put the new ContiFlexStudTM through its paces. We’ve been working hard to develop a new type of stud that provides fantastic grip on ice, ultra-secure handling, and even shorter braking distances. And we’re so confident in our revolutionary design, Mikaela and some very special friends are going to test the ContiFlexStudTM at the absolute limit in the most demanding of environments. In total, four drivers from four nations are going to undertake a very special Winter Driving Challenge. Who’ll come out on top? Follow the journey as Mikaela and some very special friends undertake the Winter Driving Challenge. There will be some surprises in store – trust us, it’s going to be a fantastic experience. Mikaela is Sweden’s fastest woman in a touring car; with the victory at Gelleråsen she made racing history. Descended from a successful motorsport family, she started her career in 2004, as first woman ever she won a race in the the VW Scirocco R-Cup in 2014, and in 2018 was the first female to win a Swedish Touring Car Championship race. Fun fact: Mikaela helped Dutch speed skater Kjeld Nuis hit 93 km/h to break the world speed skate record in 2018, driving a SEAT Ateca on Continental winter tyres with a specially-designed aeroshield at the back. Juha was born 1959 in Laukaa, Finland and is one of the most successful rally drivers in the history of the sport. The “Flying Finn” has won the World Rally Championship four times. Today he’s head trainer at the Juha Kankkunen Driving Academy, an extreme driving school located on top of a frozen lake in Northern Finland, 40 miles south of the Arctic Circle. Fun fact: Once upon a time Juha held the world records for ice driving (330 km/h in 2011), and the fastest tractor driver in the world (130 km/h in 2015). One of the most versatile and experienced drivers in racing and rallycross, Tommy’s career has taken him everywhere from touring cars and single-seaters to ice racing and hillclimbing. His record is impressive; 562 races and 124 victories, with a European Championship title in rallycross and two combined titles in the Swedish Touring Car Championship. Fun fact: Tommy is the recipient of a Gold Medal from the Norwegian Car Racing Association, a very prestigious accolade. Andrey’s driving specialty is rally cars in the “National” class of the Russian Circuit Racing Series; vehicles with engines up to 1600 cc built in Russia. He was victorious in the 2018 edition of the Behind the Wheel all-stars race, an annual event where only the most talented Russian drivers are invited to participate by the Editor-in-Chief of Behind the Wheel magazine. Fun Fact: Early in his career, Andrey miraculously avoided running over a brood of ducks crossing the road during a special rallying stage. There were zero fatalities. Quack quack! In Kuusamo in Northern Finland, 40 miles south of the Arctic Circle, motorsports legend Juha Kankkunen has established an extreme driving school. The temperatures in this remarkable setting are well below freezing – perfect conditions for pure driving pleasure. On top of a frozen lake, Kankkunen and his team of experts guide students through a series of routes and challenges on 11 kilometers of exhilarating race tracks. And because the fleet of training cars come equipped with special studded winter tyres for maximum grip, they’re capable of driving very fast – but perfectly safe – over ice and snow. Parallel parking is not the most exciting maneuver you can do in a car. But here’s an alternative approach that will test the grip of the ContiFlexStud™: Drivers must yank on the handbrake to initiate a 180-degree turn, and then smoothly glide the car into a tight position between two stationary objects. None of the tyres can be outside a specially marked box. Easy? Let’s see what our brave challengers make of it. For the next challenge, our drivers are going to reach for the skies. The car must speed around a corner and accelerate up a small ramp, then leap into the air for a distance of around 20 metres. The more grip it has on the tyres – thanks to ContiFlexStud™ technology – the more momentum it will have going up that ramp. The driver who defies gravity to travel the furthest distance is the winner. Demonstrating the power of precision through a combination of acceleration and braking, each driver must navigate a field of balloons along a stretch of track. But instead of avoiding the balloons, they have to use the tail of the car to burst them. The fastest driver wins – but there’s a penalty if they miss any balloons!